How do i move the round timer to the corner of my screen. Wiethoofdduck_ extract all hudfiles with GCFScape to a folder, use notepad++ search in files or whatever IDE you use that can search through text and look through the if_ ones that come up besides if_comp, _mvm, _match, _halloween and the ones in mainmenuoverride to have various background images. [quote=Wiethoofd]duck_ extract all hudfiles with GCFScape to a folder, use notepad++ search in files or whatever IDE you use that can search through text and look through the [i]if_[/i] ones that come up besides if_comp, _mvm, _match, _halloween and the ones in mainmenuoverride to have various background images. uniqlyHow do i move the round timer to the corner of my screen. Sorry if this has been asked before, but I really like crosshairs that flash when you do damage, how do I make a hud crosshair do this? Dyl4NSorry if this has been asked before, but I really like crosshairs that flash when you do damage, how do I make a hud crosshair do this? I cant seem to move the preset buttons help. uniqlyI cant seem to move the preset buttons help. 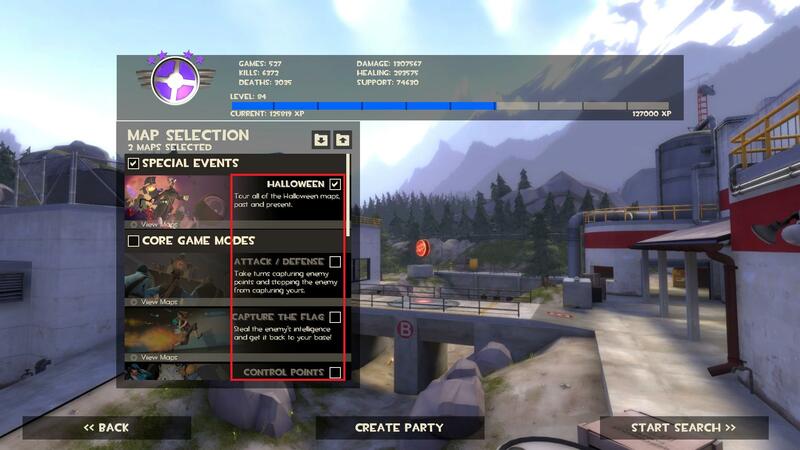 I believe they're attatched to the base class_loadout_panel in /ui/classloadoutpanel. Could be wrong. Resolved. Also, how does one remove rounded source menu borders in sourcescheme.res? [b]Resolved. [/b] Also, how does one remove rounded source menu borders in sourcescheme.res? Since the last one is available with the MagnumHUD in the /cfg folder and has a url linking to the tftv thread it is overriding the one that comes default with the game. Renaming custom and taking out files you don't need and using an text editor which can search inside text files and dig through custom and it's contents (or even extracted default hud files) should result in a lot of things to help debug or try out new stuff for huds. how can I make damage numbers fade faster? bearnauthow can I make damage numbers fade faster? HudDamageAccout and change the "delta_lifetime"
hey, im trying to implement overwatchHUD's menu into m0rehud and im trying to make all of the buttons the same. any idea on how to make these buttons work and look proper? The problem occurred across multiple huds, even stock and when I checked in tf/cfg i found the cheeky script. I don't believe I put anything related to magnumhud in there. Assuming it is possible how could I write a script to someones cfg folder with something in custom? but not my custom ones. Can anyone assist me with making them work please? Is there any way to remove/move that white line on the scoreboard without covering it? For the future, the picture is of the white line above the scoreboard that says "Name Score Ping"
How do I remove the custom main menu from a hud (so it just keeps the in game ui) since it is an old hud that has not been updated in a long time? fnmHow do I remove the custom main menu from a hud (so it just keeps the in game ui) since it is an old hud that has not been updated in a long time? This has probably been answered before but I dont feel like going through 3900 comments. diamond0wnerThis has probably been answered before but I dont feel like going through 3900 comments. [quote=diamond0wner]This has probably been answered before but I dont feel like going through 3900 comments. Still did not fix the problem with the "find a game" button not working. Did you also delete gamemenu.res? I tried deleting both and for some reason it still will not allow me to click on the "find a game" button. When I click on it, it does not open the box. Is it possible to remove the id and health that appears when looking at teammates? I tried to set both "enabled" and "visible" to 0 for the following values but I wasn't able to get rid of it completely. When doing that, I end up with a black version of the player's ID and a black box where the health cross was. I'm not really sure why disabling CMainTargetID didn't disable the whole thing (in fact, it did absolutely nothing). Also, I can get rid of it by moving those few last elements off the screen, but the reason I'm trying to edit this section of the hud is due to extreme FPS drops caused when they appear, so moving them off screen or making their height 0 doesn't really fix the problem. CitrusmanIs it possible to remove the id and health that appears when looking at teammates? I tried to set both "enabled" and "visible" to 0 for the following values but I wasn't able to get rid of it completely. [quote=Citrusman]Is it possible to remove the id and health that appears when looking at teammates? I tried to set both "enabled" and "visible" to 0 for the following values but I wasn't able to get rid of it completely. XenThePybro CitrusmanIs it possible to remove the id and health that appears when looking at teammates? I tried to set both "enabled" and "visible" to 0 for the following values but I wasn't able to get rid of it completely. [quote=XenThePybro][quote=Citrusman]Is it possible to remove the id and health that appears when looking at teammates? I tried to set both "enabled" and "visible" to 0 for the following values but I wasn't able to get rid of it completely. Update scripts/hudanimations_tf to use hudanimations_manifest.txt instead so you'll always have the default Valve animations and try again. Update scripts/hudanimations_tf to use [url=http://huds.tf/forum/showthread.php?tid=151]hudanimations_manifest.txt[/url] instead so you'll always have the default Valve animations and try again. Can someone help me update grape's version of m0rehud?